Nearing the end of his life, Dr. Sigmund Freud invites writer C. S. Lewis to his home on the day England enters World War Two. Expecting to be chastised for his satire of Freud in a recent book, Lewis, who is soon to publish “The Lion, the Witch and the Wardrobe,” is surprised by Freud’s agenda. The two enter into a witty, intellectual discussion touching on love, religion, politics and life. 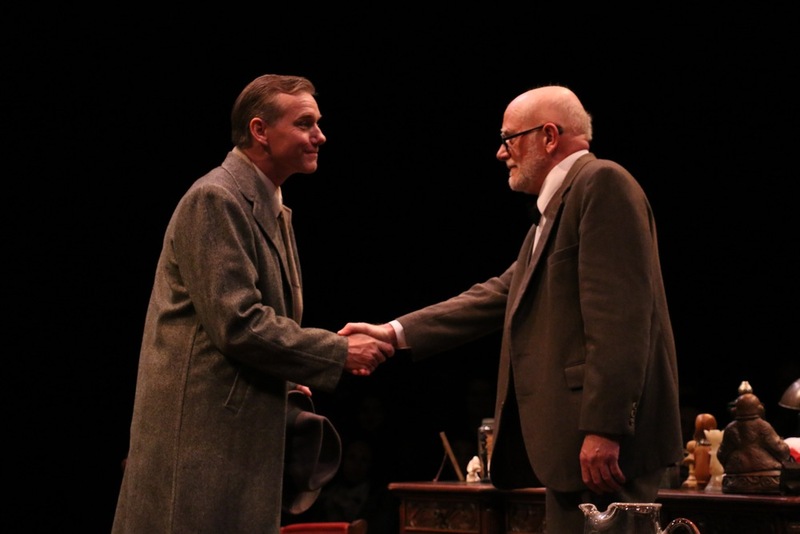 With gentle humor and sharp dialogue, Freud’s Last Session is a thrilling piece of theater. "What would happen if Sigmund Freud met C.S. Lewis?" "A show that any theater lover should see." Steve Brady* (Sigmund Freud) since appearing in last season’s West Side Story, Steve has performed on Long Island, NY, in Rock of Ages; in Ogunquit, ME, Nice Work If You Can Get It; at Orlando Shakespeare in Bakersfield Mist; back to Long Island for Cinderella; and comes directly to Riverside from Denver Center and All The Way. He's performed on Broadway in Inherit The Wind, around the world with West Side Story and A Christmas Carol, and at many regional theatres including Cincinnati Playhouse, Syracuse Stage, Rep Theatre of St. Louis, The Wilma, Gulfshore Playhouse, Triad Stage, Baltimore Centerstage, Shakespeare Theatre DC, and TheatreWorks Palo Alto. Off – Broadway, Steve's appeared at The Mint, Irish Arts, Perry Street and Soho Playhouse. Originally from Seattle, he now has an apartment in Midtown Manhattan that he never sees. Ok, let's go to the beach. David Schmittou* (C.S. Lewis) sixth show at Riverside, third show in The Waxlax. The past year was spent performing in West Side Story and Side By Side By Sondheim (Riverside), The Drowsy Chaperone (Beef and Boards), Disney’s The Aristocats (Stages St. Louis), Henry V (Colonial Shakespeare), Mary Poppins (Arts Center of Coastal Carolina. This summer he will reprise his Kevin Kline Award winning performance as “Man in Chair” in The Drowsy Chaperone (Stages).